UPDATED IV (4/4/019): Did Stefan Molyneux Fail To Properly Credit Ideas From My Book, ‘Into the Cannibal’s Pot’? The implication in this Southern Poverty Law Center article is indeed that, in a 2015 video, vlogger Stefan Molyneux liberally used the material from my book, “Into The Cannibal’s Pot: Lessons for America From Post-Apartheid South Africa,” published in 2011. The authors at SPLC hate me just as much, so they don’t care to harp on unethical use of material they had traced to me (“Into The Cannibal’s Pot: Lessons for America From Post-Apartheid South Africa”), if there was any. Still, their facts imply that no attribution was made or direct credit given to me for a Molyneux podcast based on the rather idiosyncratic ideas that came from a chapter in Cannibal titled “APARTHEID IN BLACK AND WHITE: A Strategy for Survival” (pp. 65-70). 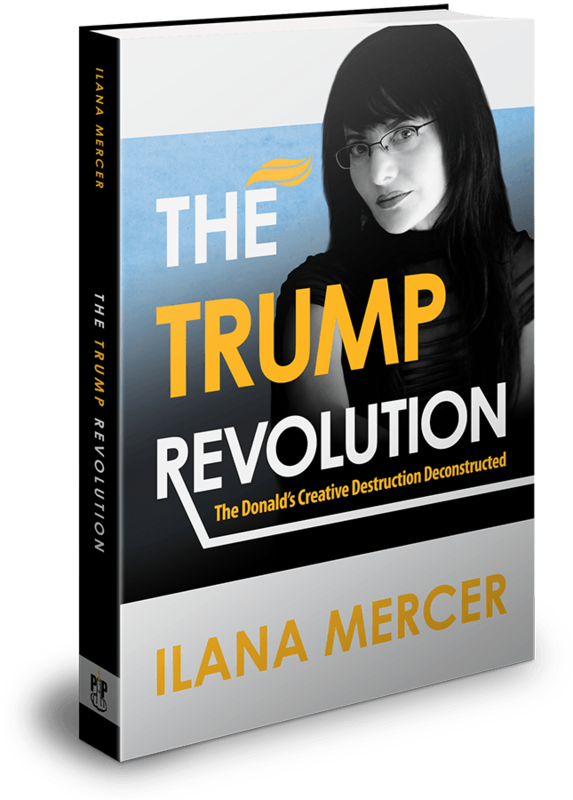 In 2015 Molyneux published a video wherein he quoted an unnamed historian who claimed that “Apartheid wasn’t an expression of racism but concern over the survival of the white population.” The source for this quote is Ilana Mercer, a paleolibertarian writer and pro-Trump activist. 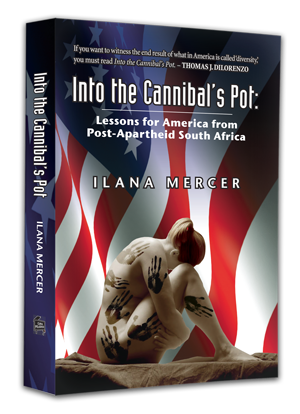 Mercer’s 2011 book, which forms the basis for Molyneux’s YouTube video, is entitled “Into the Cannibal’s Pot: Lessons for America from Post-Apartheid South Africa.” The tome received a glowing review from Jared Taylor’s American Renaissance website. “Apartheid was never based on a theory of racial supremacy; rather, it was a survival strategy for the badly outnumbered Boers,” the review reads. This is a mirror image of Molyneux’s sleight of hand: a decontextualized racism is deemed immoral but it is argued that Apartheid makes sense. The real message Molyneux and Taylor are delivering to their audiences is that the application of racial discrimination in South Africa was essential to ensure white survival (read: dominance) and that force and laws should be applied to keep different races apart. Of course, the ideas in my chapter, “APARTHEID IN BLACK AND WHITE: A Strategy for Survival” (pp. 65-70), are not quite those expressed by the second-handers. In any event, one gets accustomed to such lowly practices in this business. But if this is indeed true, and Stefan Molyneux had failed to fully credit this author for ideas that are nearly verbatim from “APARTHEID IN BLACK AND WHITE: A Strategy for Survival” (pp. 65-70)—then this is a new low. Citing one’s sources is the very essence of ethical thinking and writing. If you don’t, you can’t claim to be an ethical thinker, much less a thinker. You lose all credibility. It’s also so unmanly—and oh so very common. Yuk. Ever wonder why Stefan Molyneux, and many men on the so-called hard right (some of whom came well after me), have never asked me (one of the few people who knows the ins-and-outs of apartheid South Africa) on their shows to speak to matters South African (or to any other matters)? A LOT OF men are simply uncomfortable with certain women. (Hint: Young blondes showcase them better and are easier to best.) As a result, libertarian men (or mini-men) end up mouthing crass, historically wrong, right-wing talking points, on their shows, about my birth place. Coming from libertarians, this laxness is a disgrace. At least credit your sources if you don’t want to engage the writer! Before Into the Cannibal’s Pot, nobody spoke about South Africa in any meaningful way in the US, other than the praiseworthy WND reporters, and one or two others liberally credited in my book. You see, I cite my sources (primary and secondary) religiously. Again, many of the johnny-come-lately sorts whom the Mini-Men aforementioned (or hinted at) interview on their limited shows speak a load of right-wing crap about South Africa. Still and all, some ideas are too idiosyncratic to be generic—which is the case with a hell of a lot of what’s in Into the Cannibal’s Pot. If you can get past the author’s redundant liberal preening (it sullies a solid piece), Alexander Douglas makes short work of Stefan Molyneux’s short-on-logic book. “A (Tiny!) Bit More on Molyneux,” also by Alexander Douglas, delves into the problems of logic. UPDATE III (11/29/018): On crap output and arrogant overreach. As someone who labors over every sentence she puts out (to the best of my abilities, which are respectable but far from infallible), these points, as made by a professional logician, are good. Alas, and as noted by Tocqueville in the 19th century and Solzhenitsyn in the 20th, conformity of thought and anti-intellectualism are powerfully prevalent among Americans (the kind who follow Stefan Molyneux type Svengalis) . “An Open Letter on Jordan Peterson and Stefan Molyneux” By Alexander Douglas. * Cancel restriction on the production of American energy, clean coal included. * Develop right away a plan to prevent cyber attacks and other attacks on vital infrastructure. * Five-year ban on executive officials becoming lobbyists after they leave office. Lifetime ban on the same sorts lobbying a foreign government. * Hillary: No I don’t want her out of the race. I want to have her in the race. The report is devastating. She’s skirting on the edge. This is her history of bad judgement. I love watching Hillary fight. She can’t close the deal. * Message to Suzanna Martinez. Nothing much. * The HuffingtonPost; I don’t read it. Do they cover politics? * I’d love to debate Bernie Sanders … for charity. The problem with debating Sanders is that he is going to lose the nomination, as the system is rigged. * Debating process: We’re not debaters, we businessmen; we put people to work. We businessmen don’t talk, we do. * Regulating energy: The Federal government should get out of the way. They’ve put the coalmines out of business—which is what Hillary has promised. Energy independence and exporting energy is what Trump promises. Coal can be restored, if regulations are reduced. All I can, says Trump, is free-up coal and let the market work. Market forces are a beautiful thing. * Give the people of the US a piece of the profits from the Keystone Pipeline and other such projects. * Lower taxes are key to economic vitality. America is over-regulated. Regulation is even more of a problem than taxes, which will go down. * On first-day duties: Trump will be “unwinding various executive orders,” not least the ones affecting the porous border on the country’s Southwest. * Intends to make use of the Republican campaign-infrastructure machine. * Fracking and our feathered friends: Bernie will ban it; Hillary will ban it. We’re going to open it up. Solar is expensive. It has a 30-year payback. And it’s killing all the eagles in California, one of the most beautiful and treasured of our birds. * Blessed be the Farmers. * Accursed is the New York Times, which doesn’t need Donald’s help in discrediting itself.